The Pointersaurus is a 28″ two meat or four vegetable topped pizza that weighs over 10 pounds! 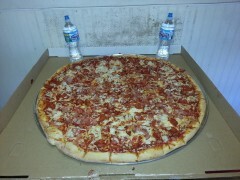 It is one of the world’s largest delivered pizzas! The Largest, Fastest, and Most Delicious Dinosaur in History! – Contestants must call at least ONE DAY in advance for reservations to try the challenge, preferred to be at 3pm any day of the week. Any derivations are at the manager’s discretion. – Napkins may not be used to absorb pizza juices. – If you slay the beast, your name will appear on the hall of fame. Winners also receive t-shirts.